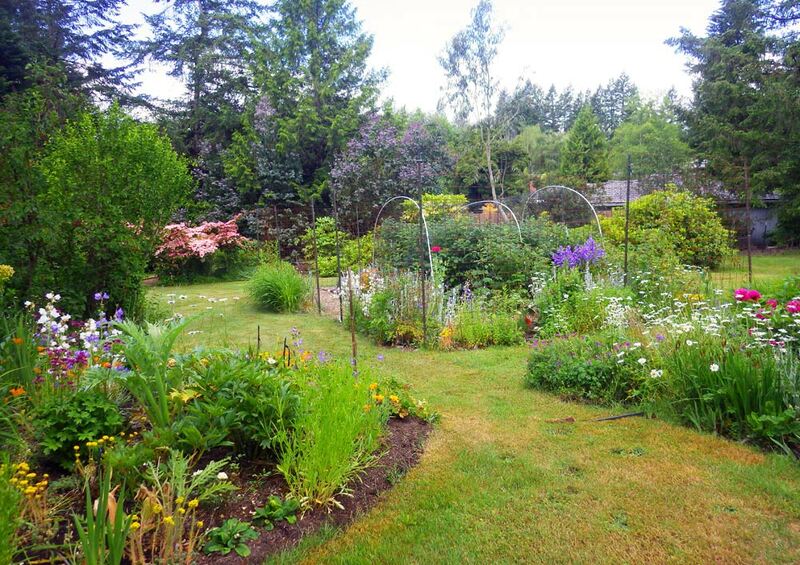 In the middle of Bainbridge Island, there is an unusual garden gem. 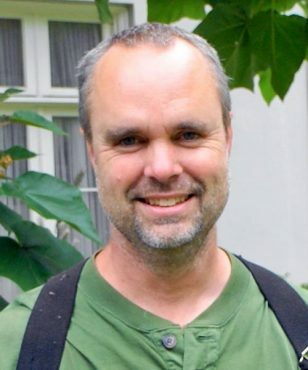 “This started out as a permaculture project, but mostly I just have a lot of fun with trees,” says Mark Shaffer. In 1978, Shaffer and his wife, Susan, purchased 1908 farmhouse on 5 acres, half wooded and half “old growth scotch broom.” The long, skinny parcel was originally part of the historic Gazzam property, and they would eventually turn it into a sort of tree museum of permaculture. 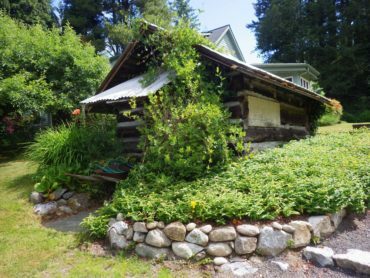 The Shaffers moved to the old farmhouse after arriving on Bainbridge from Colorado, where Mark Shaffer was a hydrogeologist and Susan Shaffer a preschool teacher and teaching assistant. 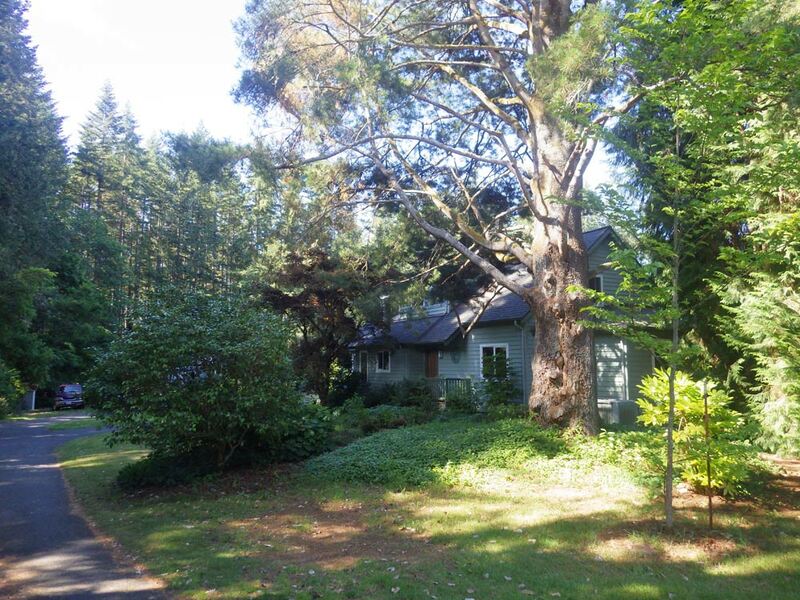 Along with scotch broom, the property also came with 40 chickens, five ducks, two roosters and some Chinese geese. Although the farmhouse was rebuilt in 1996, the original barn and root cellar are still present. After clearing the nonwooded portion of the property near the road, the Shaffers planted about 500 Christmas trees as a temporary use of the land. Island residents may remember the Christmas tree farm on New Brooklyn in the 1980s. Then later that decade, the Shaffers turned their eyes to permaculture. They travelled to Nevada to take a class from Bill Mollison, often referred to as the father of permaculture. 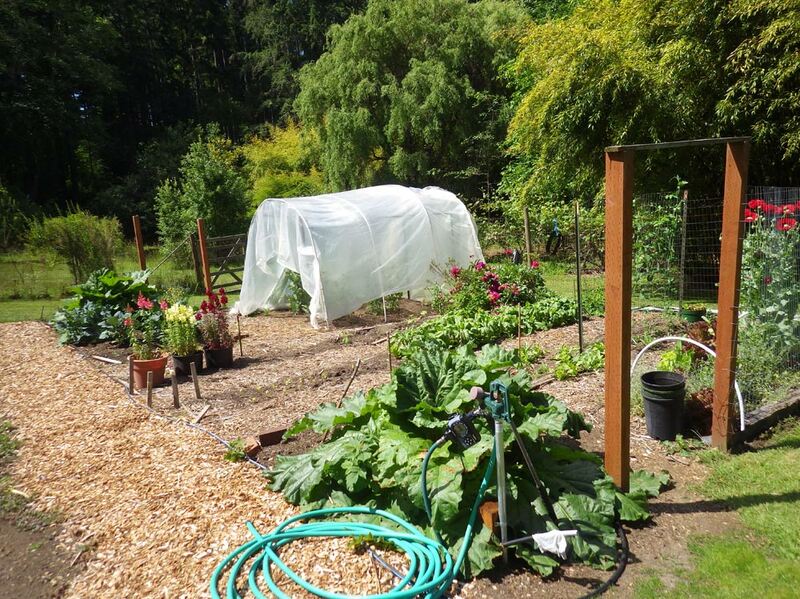 Returning to Kitsap County, they got involved with Seattle Tilth and set out to create a permaculture “pocket” on their acreage. 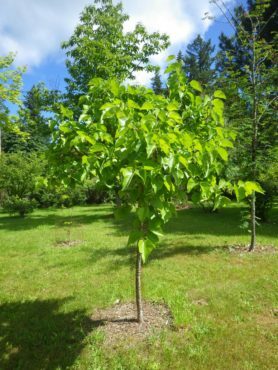 Various trees with edible fruit or seeds were planted as well as many flowers and vegetables. Most of the earlier planted trees were edible for people or animals. This was the double-edge sword of attracting wildlife to the yard. On the one hand, their plantings provided food and habitat for wildlife on an increasingly developed island. On the other, the wildlife also would ransack the orchard, especially the cherries. Birds were, and still are, the biggest problem. Mark Shaffer planted sumac specifically for the birds but the cherries are still raided. 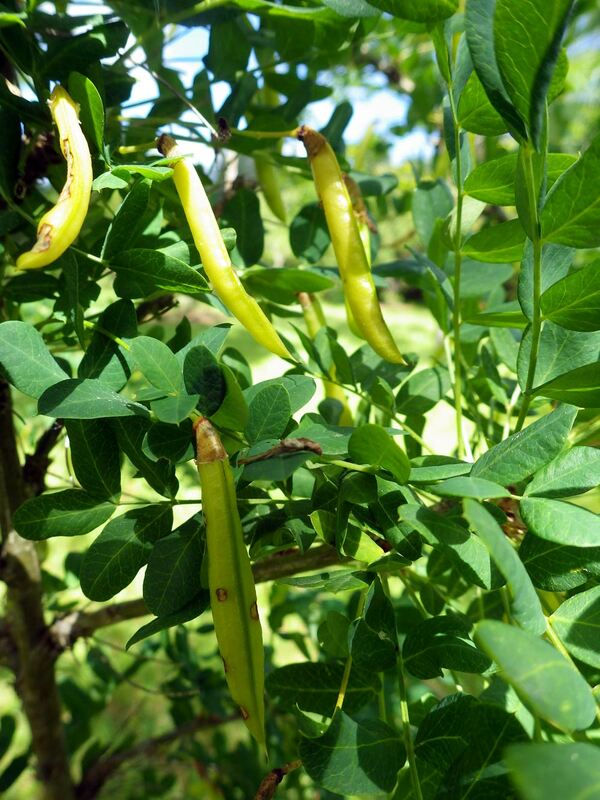 Siberian pea shrub (Caragana arborescens), inedible to humans, is prized by quail. With their English walnut tree, it is a race to get the walnuts before the local squirrels run off with them. 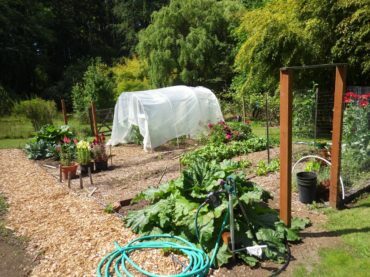 The original intent of a permaculture “farm” evolved over time into a permaculture arboretum. 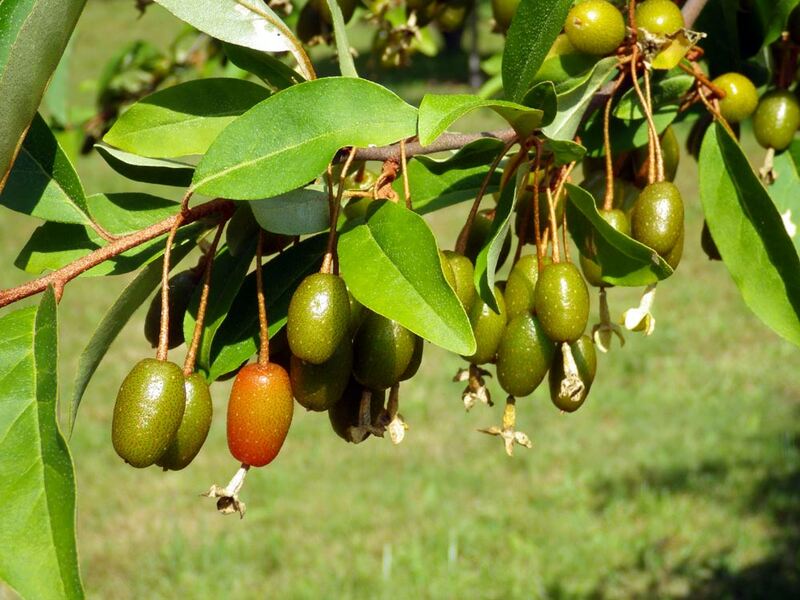 While the common, everyday fruit trees like cherries, peaches, pears and apples are well represented, the Shaffers have amassed a broad collection of less common species. Maples and oaks were planted as replacements for the quickly disappearing Christmas trees. 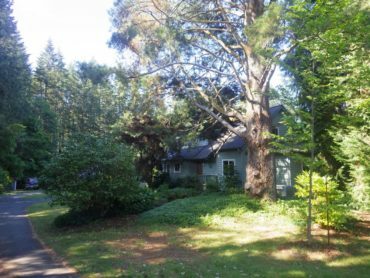 A sugar maple is particularly prized by Susan Shaffer for its brilliant, autumn-orange foliage in a Western Washington landscape where yellows dominate the native fall colors. A few oaks provide shade and acorns for the healthy squirrels that roam the property. Other trees uncommon in this region planted by the Shaffers include quinces and the walnut relatives pecan, hickory and hican. Both the wild and cultivated quince are represented. The couple turn a portion of their productive quince harvest into quince paste, commonly known as membrillo, a jelly-like product similar to apple butter. Pecan, a well known nut, grows alongside both shagbark and shellbark hickories. They also have a hican, a hybrid between pecan and hickory. 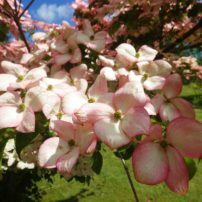 While such hybrids occur naturally, they often have undesirable qualities for cultivation. 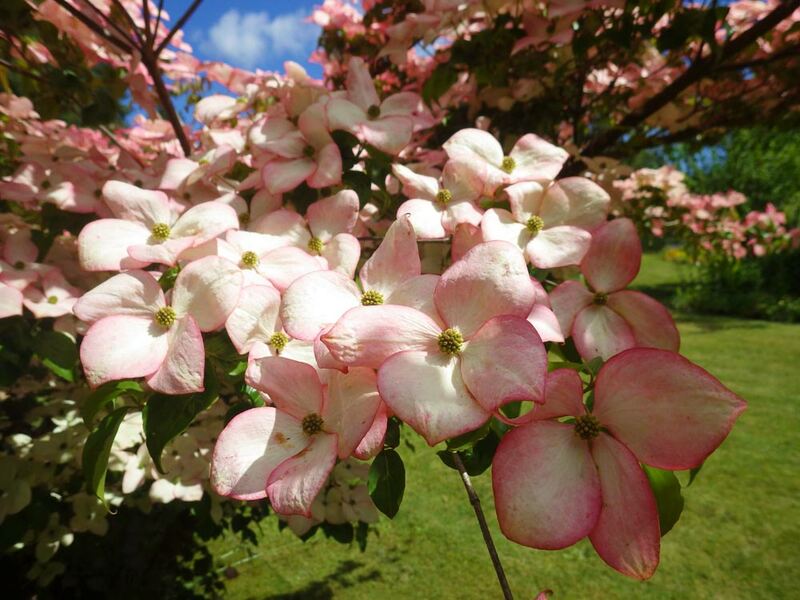 Some hybrids, however, combine the better characteristics of both parents and are propagated by growers. 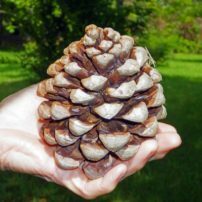 Perhaps their most well represented group of unusual food trees are the nut pines. 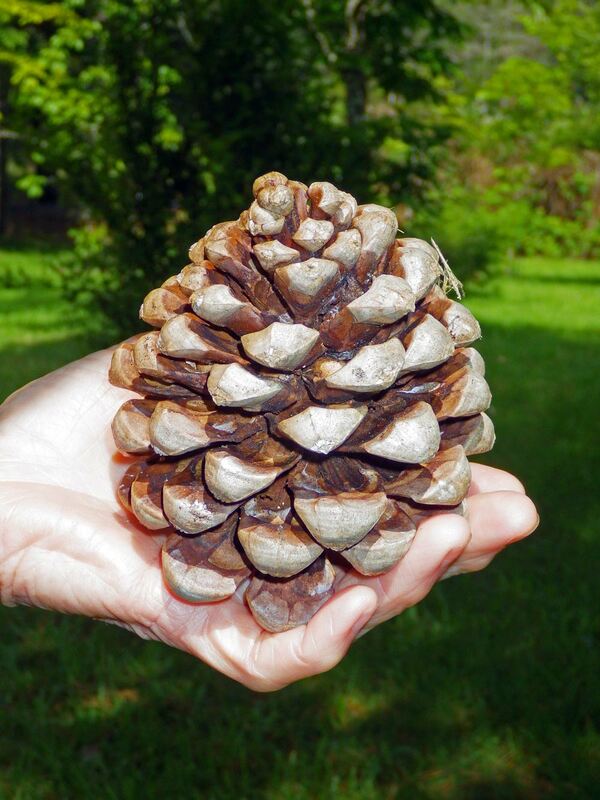 The Shaffers have around a dozen species including Italian stone pine, himalayan nut pines, ghost pine, Mexican pinyon and digger pine, producer of the largest of all pine nuts. 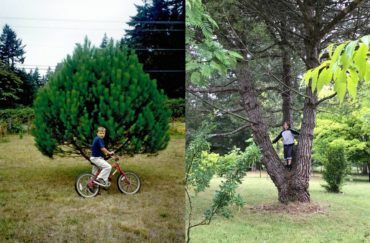 Their largest, the Italian stone pine (Pinus pinea), was planted back in 1990 and has grown to about 20 feet tall with multiple trunks. Perhaps more than food, it is a good climbing tree for their grandchildren. Nestled in their tree museum is a large shrub, a little taller than a person, called goumi or cherry silverberry (Eleagnus multiflora). A prolific producer of silvery-scaled orange fruits, it is prized by birds and people alike. The fruit is juicy and flavorful. A little tart, it is good to eat fresh but can be juiced or made into fruit leather. 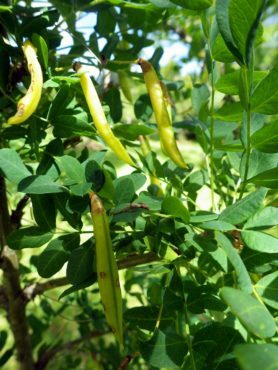 In permaculture terms, goumi is a good choice for growing on poor soils; they join with nitrogen-fixing bacteria to help improve the surrounding soil for themselves and nearby plants. 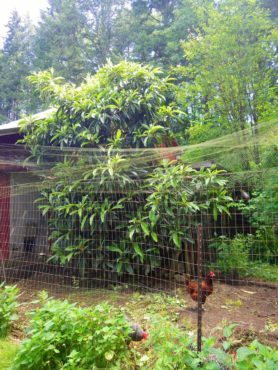 Hidden within the fenced area of their chicken coop is a thriving loquat. 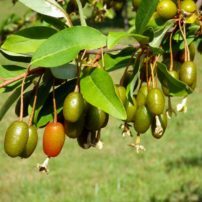 A tropical fruit tree, it can survive in this area with protection. The chicken structure provides some winter protection, in addition to keeping the local deer away. Plentiful chicken manure probably does not hurt either. Unfortunately, loquat blooms here in October and the Shaffers are unable to enjoy its juicy tropical fruit due to the effects of winter temperatures. In addition to the permaculture tree collection, the property also offers wooded areas and a small wetland. A small island in their small pond has summer-blooming southern magnolia, white-flowered dove tree and the fairyland-like bald cypress. Swamp oaks also accompany the wetland trees. Winding trails have been carved into their forest. Here and there within, various nonnative or near-native forest trees have been planted. Port Orford cedar and magnolias dot the wooded landscape. 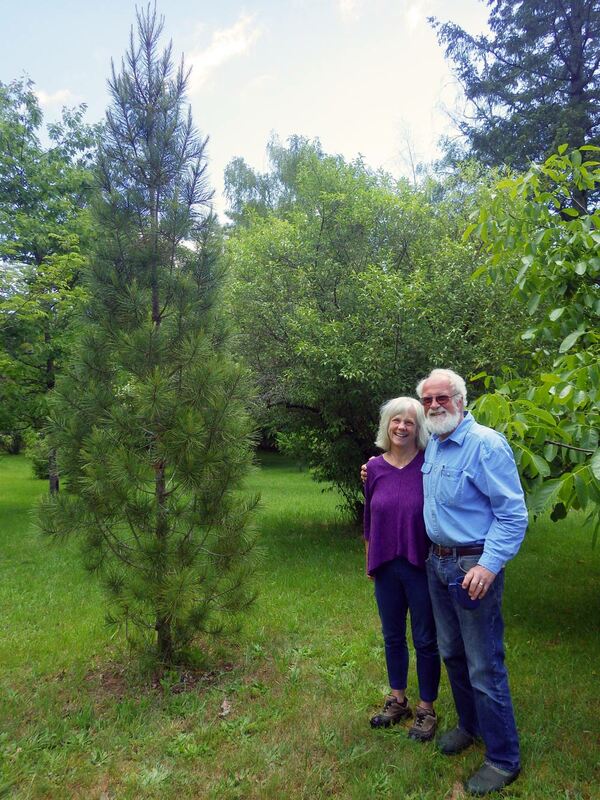 While it was originally intended as a private permaculture garden, the Shaffers’ 5-acre plot has turned into a nice hobby museum of edible trees. They spend much of their time tending to their wildlife-attracting trees, garden and now modest collection of chickens. As an ode to their former Christmas tree farm, they annually decorate a tree near the road with Christmas lights.